We continue our work by expanding our audience while promoting those in the sustainable fashion and chemical-free industries for the health of future generations and environmental preservation. With the purpose to inform and educate more people about sustainable fashion in partnership with educators guiding the new fashion professionals, we look forward to implementing content into video and deliver through television, social media & online promotional markets. Main stream media makes possible to reach thousands of people receiving the message of what is sustainable fashion, and chemical-free beauty products. Our added purpose is for people to make informed choices exercising their purchasing power in support of the green movement. 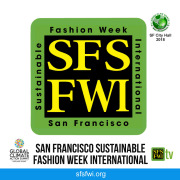 Would you recommend San Francisco Sustainable Fashion Week International? I didn't receive any type of confirmation that my application was received (they could really benefit with an auto-response/confirmation). Found another non-profit to volunteer at, in the mean time.